KoolPad is an accessory designed to reduce sweating and increase comfort when sitting, making it well suited for couriers, heavy equipment operators, and persons utilizing a wheelchair. 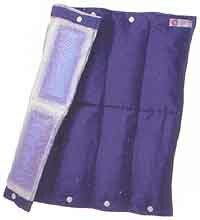 It also works well for stationary jobs, where it can be placed over legs for general cooling. The unit weighs only 5.1 lb., and recharges after 20 minutes in ice water.